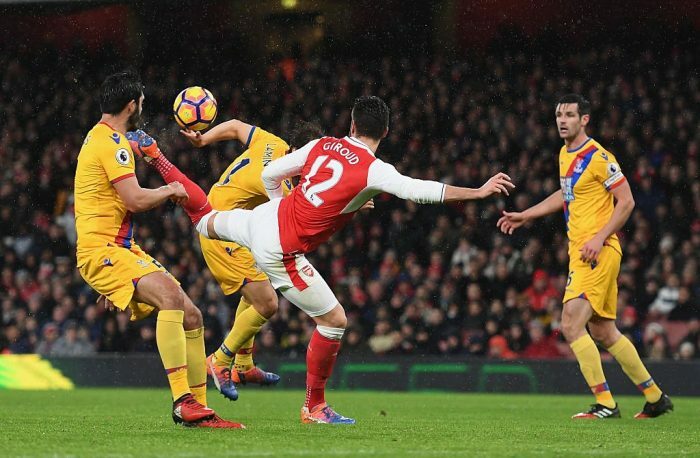 Arsenal striker Olivier Giroud has won FIFA’s Puskas Award for his stunning scorpion-kick goal against Crystal Palace in January. Giroud beat Deyna Castellanos of the Venezuela U17 women’s team and South Africa goalkeeper Oscarine Masuluke of Baroka FC to the award, which recognises the ‘most beautiful goal of the season’. Castellanos scored virtually straight from kick-off with a remarkable strike from the half-way line while Masuluke netted a stoppage-time bicycle kick. But Giroud’s stunning effort at the Emirates in January, which helped Arsenal beat Premier League rivals Palace, was deemed the best of the lot and the Frenchman received his award at Monday’s ceremony at the London Palladium. ‘Thank you very much, first of all I want to say it’s an honour for me, I’m delighted to receive their trophy in front of so many legends,’ Giroud said at the awards ceremony.